The National Volunteering Week 2014 (13th edition) will take place between May 12-18 2014. At the end of the month of March we will launch the online form for you to join the national calendar of events. 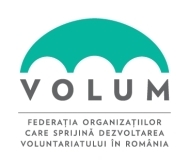 Follow us on Facebook and www.voluntariat.ro/snv for updates! The NVW is an annual national event which mobilizes as many organizations and their volunteers as possible, in order to celebrate volunteering, attract community support and publicly recognize volunteerism. Volunteering is an activity performed out of free will, whereby a person offers his or her time, talent, skills and energy for the benefit of the community or a group, without a financial reward ...... learn more!